We start each project with a review of the site you have chosen for the course. We determine a list of needs the space has in order to be transformed into the golf course of your dreams. We conduct business and preliminary concept studies, in order to provide you with a comprehensive look of future plans. We will do planning for the route of the course, as well as outlining the plans of the land. Additionally, we will explore the budget analysis and cost value reviews, before moving forward. We will set up weekly, as well as bi-weekly construction reviews for your convenience. We will contract administration for the project, to ensure it will be carried out properly. We review change order, show drawings, and project records preparing for the part of the process where we take the preliminary draft to a final and accepted plan. 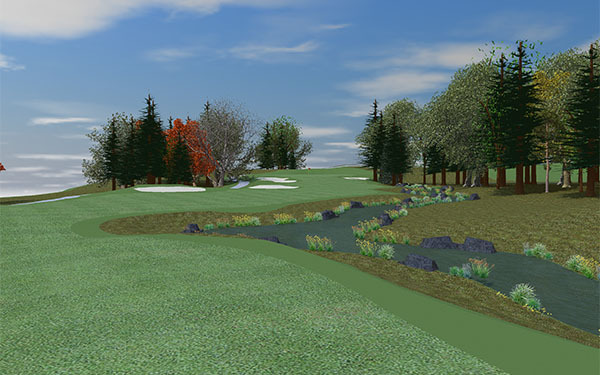 Once the plans for the course have been finalized, construction plans that outline the following will be made: Staking, Clearing, Grading/Drainage, SWPPP/Erosion Control, Engineering/Environmental Plans, Green/Tee/Feature Details Plans, Irrigation, Hardscape, Grassing/Sodding, Landscape, Full Specifications, Detailed Bid Forms, Bidding/Acceptance/Evaluation, and Detailed Cost Estimates to the Owner. Once construction is complete, we will provide the course with an agronomic and pre-opening review. Making sure your course is presenting at its highest potential. We are available to help assist you in publicity efforts to get the word out about your course and build anticipation for the grand opening. Additionally, we will help with the grand opening, making sure, again, your course is presenting at its highest potential and is getting the recognition it deserves from industry professionals as well as the public. We are able to take a concept for a future golf course and convert it into an incredibly detailed 3D rendering. This is an important feature for many clients because it provides them with a model they can show to investors to get them as excited about the project as they are.